(Whittier) The La Serna Lancers and the Warren Bears battled for 48 minutes Friday night and put 93 points on the board between them. In the end the Bears squeaked out a one point victory 47-46 over the Lancers. Chris Venegas did most of the damage for the Bears. 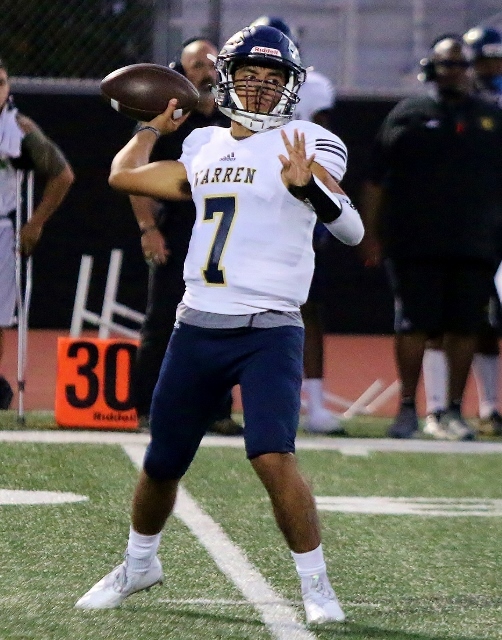 The senior quarterback accounted for six total touchdowns while throwing for 313 yards and rushing for another 87 more. Warren started the scoring party early in the first. Arvionte Sheffield got loose on a 30-yard run to cap a six play, sixty four yard drive. Kevin Arias added the extra point for the 7-0 lead. La Serna answered right back with a score of their own needing only two plays to get into the endzone. Andrew Henriquez found Abraham Shalash all alone on the near sideline. Shalash went in untouched from 41 yards away. Chandler McCaffer added the extra point to knot the game at 7. The Bears closed out a high scoring first quarter with two more touchdowns on passes from Venegas of 54 and 18 yards to Xavier Osbey and Robbie Colenzo respectively. Chris Venegas had six total touchdowns in the win over La Serna. Down two scores, the Lancers got back on the board with 8:19 left in the first half. Joey Bustos bulled his way across the goaline from eight yards out to cap a 58 yard drive. Skyler Warner filled in for an injured McCaffer and nailed the extra point. La Serna pulled into the lead for the first time on the night courtesy of a 97-yard interception return by Paul Duarte. Deep in Lancer territory Venegas fired a pass into the flat that Duarte stepped in front of. With a head start going the other way, no one was going to catch him. The Lancers went for two and got it when Dylan Long found Bustos in the corner of the endzone. On the ensuing drive, the Bears only needed one play to take the lead back. Venegas found Desmond Carnes over the middle and 71-yards later, Carnes hit paydirt. Warren went for two but was turned away by the Lancer defense. As time was winding down in the half, a La Serna drive stalled at the Bear 18. Shalash came on a booted a 35-yard field goal to cut Warren’s lead to 26-25. Coming out of the locker rooms after the break, the Bears lined up for the kickoff to start the second half. A pooch kick by Arias landed between Lancers returners and was recovered by Warren. Four plays later the Bears were in the endzone again with Venegas getting his first on the ground from 26 yards away. Down 33-28 the Lancers came out on the ensuing possession and drove 65 yards on 14 plays. Bustos got the call again from one yard away and made it count. Henriquez looked to and found Shalash for the two point conversion and the tie with 2:25 left in the third. The way the two teams had been going toe-to-toe all night you had to figure the tie wouldn’t last long and it didn’t. Three plays into their next possession, Venegas called his own number went up the middle and outraced the Lancer defenders to the endzone. Arias added the extra point and the Bears were back on top 40-33. Good teams respond when getting a punch in the gut such as the Venegas score and it wasn’t long before La Serna was in the endzone. Henriquez found none other than Shalash free in the flat who took it 27 yards for the score to cap a 64-yard drive with just one tick showing on the third quarter clock. Going into the final frame, it appeared that the first team to get a stop would be victorious. The Bears did get that stop as a Henriquez pass fell incomplete on a fourth and four and the Warren 11. The stop came after the Bears marched 68 yards for a score to start the fourth. Down a score, the Lancer defense was called upon to get their own stop and they did just that, holding the Warren offense to a four and out. After the Bear punt, La Serna was set up first and ten from their own 34. Six plays later Luke Perez scooted in from six yards out. Lancer head coach Andy George faced a choice of an extra point to tie or to go for two and the win. At home and in front of a large band of La Serna faithful, George decided to go for two. On the play Henriquez rolled to his right and looked for an open man. Henriquez fired a pass in the direction of Jakob Abston who couldn’t haul in the pass. The ball fell short and with it the hopes of a Lancer victory. Next week La Serna will open up league play when they take on the California Condors. Warren will also start league play next week when they travel to Lynwood. 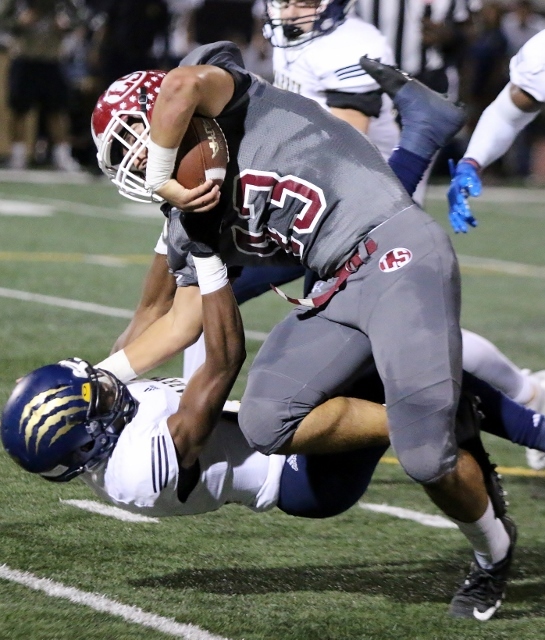 1 Comment to "Warren Outlasts La Serna"
Great recap! Exciting game, offensively!